Four young couples pose in front of a dusty car that is parked on a dirt driveway. Three of the women stand in front of a man, likely their beaus. The fourth woman is keeping her distance from the fellow who stands behind her. The three men who are standing behind the three women appear to be quite “handy”. One supposes that we are looking at a photograph of a “quadruple date”. The setting may be a Texas ranch. This photograph was found in the Texas Hill Country. Do you think these four couples arrived at this location via the car that is parked behind them? If so, the seating must have been quite crowded. The image was photographed by Foxco in 1946. The company has an interesting history. The Fox Photo Studio was opened by Arthur C. Fox in 1906 in San Antonio, Texas. Fox sold the studio for seven hundred dollars to Carl D. Newton in 1909. Newton was a clever entrepreneur. One of his gimmicks was to offer a free camera to anyone buying three rolls of film and prepaying developing and printing fees. His successor to the business was Carl D Newton II. By the mid 1930’s Fox advertised itself as the world’s largest Kodak finishers. Their processing plant was in operation around the clock. The company expanded and opened facilities in Dallas, Houston, Louisiana and Oklahoma. The company grew and grew and ultimately reached 12,000 dealers nationwide. In 1986, the company was sold to Kodak. Carl D Newton III kept the retail division of the business, calling it Fox Photo. Later, the business changed hands a number of times until it faded into history. This photo was taken somewhere near San Antonio. The photo is printed on paper thinner than stock used for cdvs or cabinet cards. This photograph measures about 3 1/4″ x 2 1/4″ and is in good condition (see scans). This vintage photograph features a group photo of what is likely an extended family. The two cars ferried six adults and three children to this rural spot for their portrait. The group is standing on a dirt road and posing in front of an agricultural field. One of the men in the photograph is wearing a military uniform. Perhaps he is home on leave. The image was photographed by Foxco in 1944. The company has an interesting history. The Fox Photo Studio was opened by Arthur C. Fox in 1906 in San Antonio, Texas. Fox sold the studio for seven hundred dollars to Carl D. Newton in 1909. Newton was a clever entrepreneur. One of his gimmicks was to offer a free camera to anyone buying three rolls of film and prepaying developing and printing fees. His successor to the business was Carl D Newton II. By the mid 1930’s Fox advertised itself as the world’s largest Kodak finishers. Their processing plant was in operation around the clock. The company expanded and opened facilities in Dallas, Houston, Louisiana and Oklahoma. The company grew and grew and ultimately reached 12,000 dealers nationwide. In 1986, the company was sold to Kodak. Carl D Newton III kept the retail division of the business, calling it Fox Photo. Later, the business changed hands a number of times until it faded into history. This photo was taken somewhere near San Antonio. The photo is printed on paper thinner than stock used for cdvs or cabinet cards. The photograph measures about 3″ x 2 1/4″ and is in very good condition. 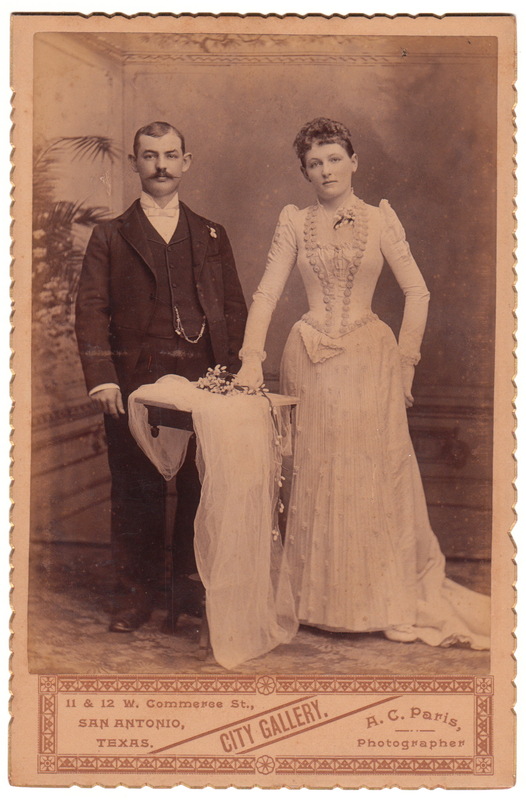 A. C. Paris, the proprietor of the City Gallery of San Antonio, Texas, produced this elegant wedding portrait . On the reverse of the cabinet card is an inscription stating “Alex Rossy, Josephine Fink’s father”. The cabinet card’s edges are gold embossed and scalloped. Census research reveals that the groom in this image, Alex Rossy (1862-1925) was the son of Charles and Aminda Rossy. Alex’s father was of Austrian ancestry. The 1880 US census reports that Alex was the fourth of seven children living in the Rossy’s home. San Antonio business directories assert that Alex’s occupation for many years was “Cigar Manufacturer”. Josephine Fink was actually Josephine Rossy Fink (1897-1980) and she was the daughter of Alex Rossy. She later became the wife of Lewis Fink. 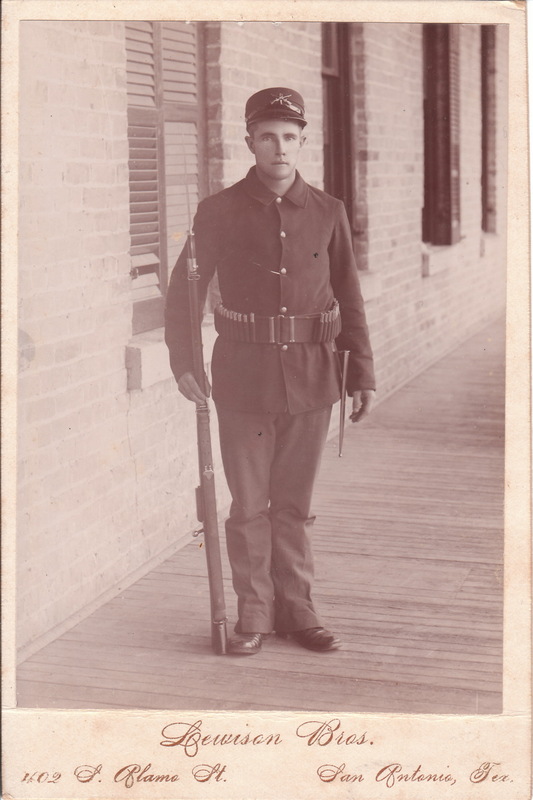 This Cabinet Card is a portrait of a Spanish American War era soldier posing in San Antonio, Texas. San Antonio was a city where a number of troops were organized for participating in this war. Note that the soldier is well armed with both a rifle, bayonet, and knife. Check out his ammunition belt. Ironically, the cabinet card’s photographer, Lewison Brothers, headquarters their studio on South “Alamo” Street. This street is the location of the famous Alamo which was the location of a battle to the death which occurred in the war for Texas independence.